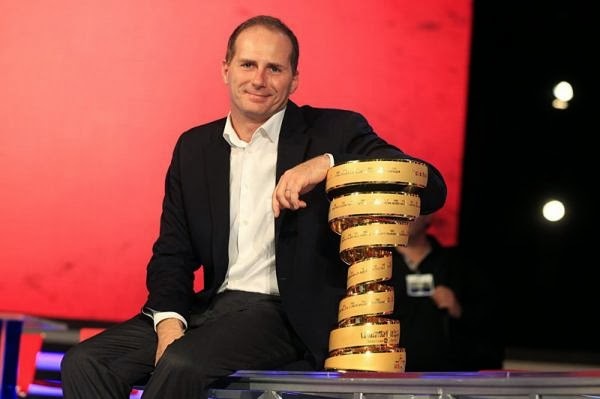 Michele Acquarone, Managing Director at RCS Sports (owner of the Giro d'Italia, MSR, Il Lombardia, +), has been been suspended as a precautionary, "non-disciplinary", measure while an investigation of a shortfall of 13 million euro is investigated. Always present at their races, Aquarone is said to be not appearing this Sunday at Il Lombardia. It will be more telling to see if he's present at the 2014 Giro d'Italia official presentation on Monday, October 7th. Aquarone took over the reins from Angelo Zomegnan soon afterward the 2011 Giro d'Italia. Sad news. There were many complaints about the autocratic Giro directors of the past like Torriani and Zomegnan, but financial chicanery wasn't one of them.